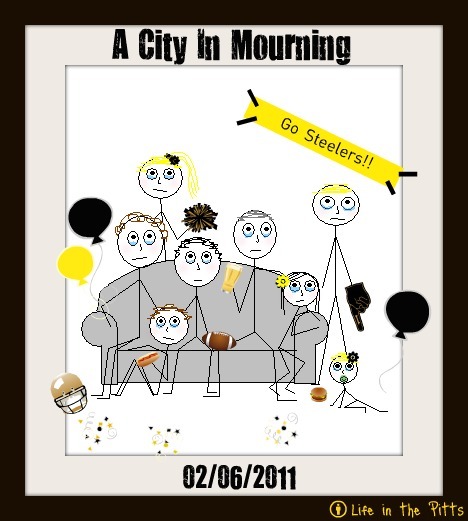 Life in the Pitts: Dear Pittsburgh: It's ok to cry. 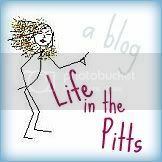 Labels: Pittsburgh, Wait- did you say "Yinz"?? ha ha ha ha!! That's pretty funny. Awww... I love the tears in everyone's eyes! I mean, I don't love tears. This is hilarious. But sad. But it's funny because it is sad :) Very well done. Now, I have to ask...did you have this pre-drawn, ready to be decorated with Packers' OR Steelers' gear? Jenn, that's a great question. I rushed home after the game, and drew it then while Kurt was rolling his eyes and muttering things like "I wish you loves me more than the computer." And as soon as I finished, I hit publish. It IS ok to cry. I felt the same way last year when the Colts lost. What a cute drawing. Very creative. Hahaha! Oh I hate football. Was there a game on yesterday? The sad baby at the bottom is cracking me up. Oh, that is just so sad. I am so sorry for your loss. So despite my smiling at the end of the game in trying to be a good sport, yeah that's pretty much how it felt on the inside. I don't feel too depressed. It was a good game and a great post season. And there's always next year! I made guacamole in the spirit of the Super Bowl, but I didn't even watch it :) Go Seahawks--LOL!! Sorry for your loss. In other news, your stick figures never cease to amaze me! Best drawing yet. Too bad it is so sad. This is really cute...and true! Have you abandoned us forever? Are you still in mourning? Man, you've been away forever. What are you doing? Or is it obvious that you're *still* in mourning, like a true fan?